Many Americans have discovered that those entrusted to protect us often become the most dangerous threats. Whether it's corrupt cops, bogus journalists, or even Ponzi-scheming church elders, it's not difficult to understand why trusting authorities has seemed like a risky proposition. Now, another institution deserves extra scrutiny. A closer look at the Securities and Exchange Commission reveals a single moment in time when the future of the country was transferred from the middle class to the uber-rich. The story of the SEC begins with power and corruption. 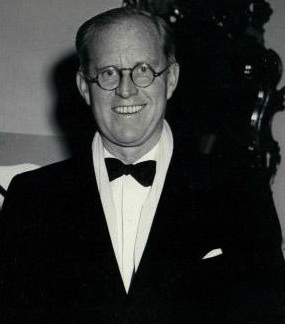 Joseph Kennedy became the first chairman of the SEC in 1934. Before joining the SEC, he was a manager at Hayden, Stone and Company. Kennedy left the company to trade his own account and made his fortune by manipulating the stock market. After becoming SEC chairman, he outlawed the manipulative tactics that made him rich. In 1981, President Ronald Reagan appointed John Shad chairman of the SEC. He was the first Wall Street executive to lead the SEC since Joseph Kennedy. Previously, he was vice chairman at E. F. Hutton & Company. Shad, like the Chicago economists who influenced him, believed that a deregulated stock market was good for the economy. In November 1982 the very government agency that is supposed to regulate the stock market adopted Rule 10b-18, which instead encourages corporations to manipulate stock prices through open-market repurchases. Instead of reinvesting profits in their businesses, management uses stock buybacks to inflate their earnings per share so they can reap windfalls with their stock options. Rather than invest in real innovation, they choose to loot the company for their own benefit, underpay their workers, and deprive consumers of true value. Recently, buybacks even exceeded operating income, which means CEOs are pillaging reserves to pay themselves. This is pirate capitalism at its finest. We previously discussed how the stock market is disappearing in one giant leveraged buyout, but many readers were skeptical. How could the entire stock market disappear? Mathematically, it is possible, especially at the current rate of stock repurchases. In Economics 101, we are all taught that the stock market is a capital-fundraising mechanism for businesses. We assume this to be true, even in the absence of evidence. However, this hasn't been true since the SEC rigged the market in 1982. Since the mid-1980s, in aggregate, corporations have funded the stock market rather than vice versa (as is conventionally assumed). Over the decade 2005-2014 net equity issues of nonfinancial corporations averaged minus $399 billion per year. 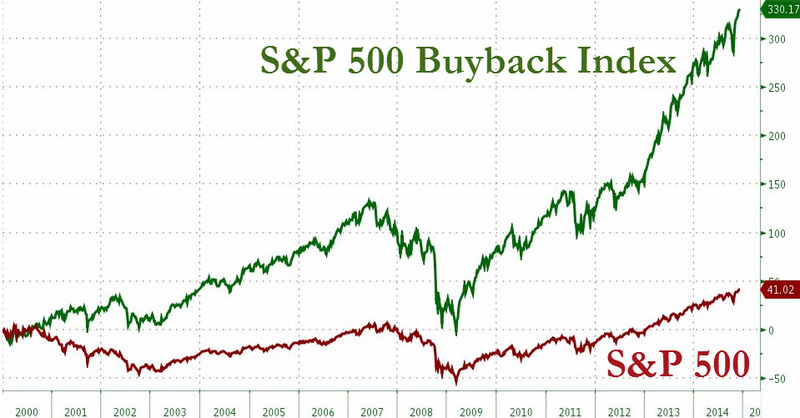 One glance at the S&P 500 Buyback Index shows how manipulated the market really is. The index contains 100 stocks in the S&P 500 that have the highest buyback ratios, which is buybacks divided by the market capitalization. The Buyback Index, which is accessible via ETF, trounced the S&P 500. Since 1982, the entire market has been nothing but one massive slow-motion leveraged buyout. This places the SEC right up there with the Federal Reserve in market manipulation credentials. Buybacks bear a considerable part of the responsibility for a damaged U.S. economy. This mode of resource allocation serves to concentrate income and wealth at the top of the distribution and comes at the expense of investment in the types of stable, remunerative career employment opportunities that support a broad-based middle class. When the most profitable corporations are in a downsize-and-distribute mode, sustainable prosperity in the U.S. economy becomes an impossible goal. As the market goes higher in the manipulated buyback frenzy, workers continue to be left in the dust. And you can always count on the manipulators to bail out at the last minute. After igniting a buyback-fueled bubble, John Shad left the SEC just four months before the 1987 stock market crash to become Ambassador to the Netherlands. Two years later, the Justice Department asked him to become chairman of Drexel Burnham Lambert. The revolving door is open for business.